Aside from dinner at Momofuku Daisho, I also managed to get my teeth into a number of other restaurants during my stay in Toronto. I hereby present to you Canoe, Acadia and Pure Spirits Oyster House. 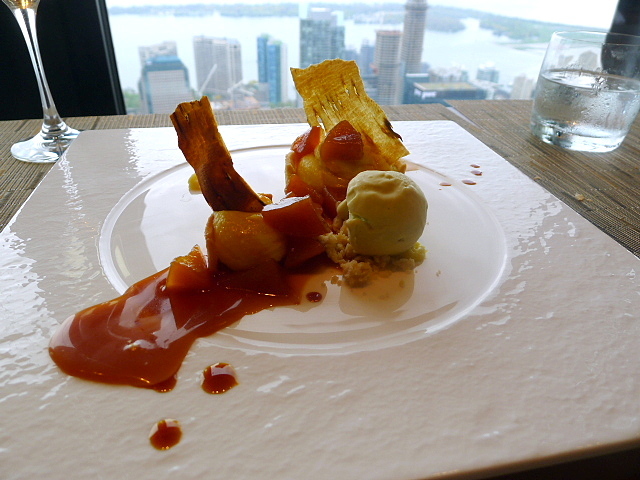 Canoe Restaurant is part of the Oliver & Bonacini Restaurant Group, a partnership founded by Peter Oliver and Michael Bonacini in 1993, a pair of restaurateurs who have since created a string of 11 successful fine dining restaurants in Ontario, Canada. Their restaurant, Auberge du Pommier, ranks highly in the guidebooks as being one of the best fine dining venues in Toronto. 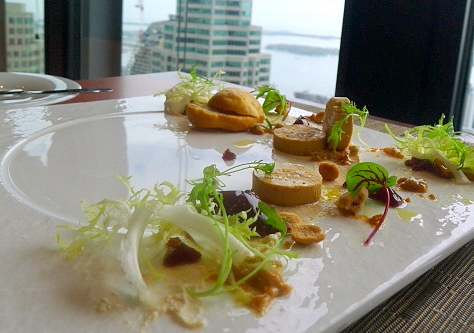 Canoe is special because of the views that it offers of downtown Toronto and Lake Ontario. 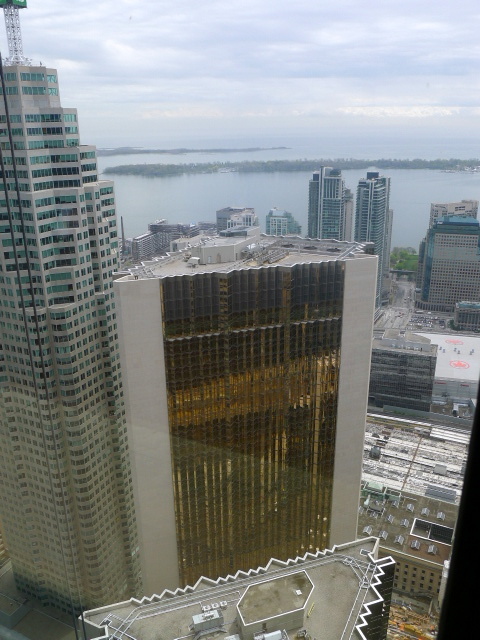 It sits on the 54th floor of the TD building, and its height is obviously its advantage. While we were waiting for our table to become ready we were lucky to be placed at the bar window seating area to wait. Not all tables offer a bird’s eye perspective of of Toronto so we were quite happy to stay put for the duration of our lunch rather than move. In view, slightly to my left, was the Bank of Canada, a rather impressive building as apparently the golden panels you see is made from REAL gold. Slightly to my right was the CN Tower, the most iconic building in Toronto. 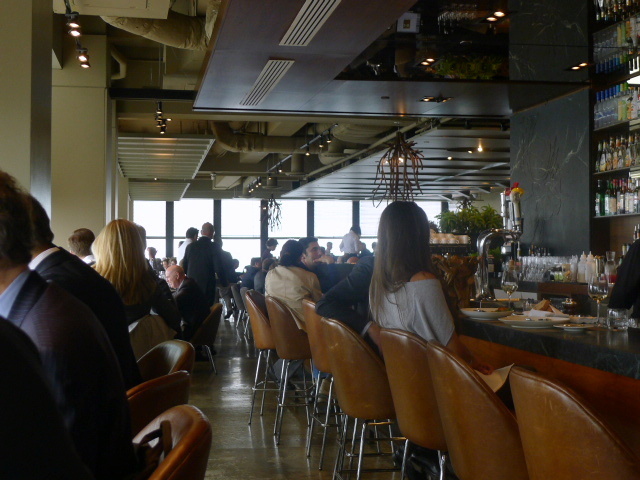 I am a bit apprehensive about restaurants with views in downtown areas for fear that the high prices charged is a reflection of the location rather than the food. However, the food at Canoe turned out to be pretty damn good. 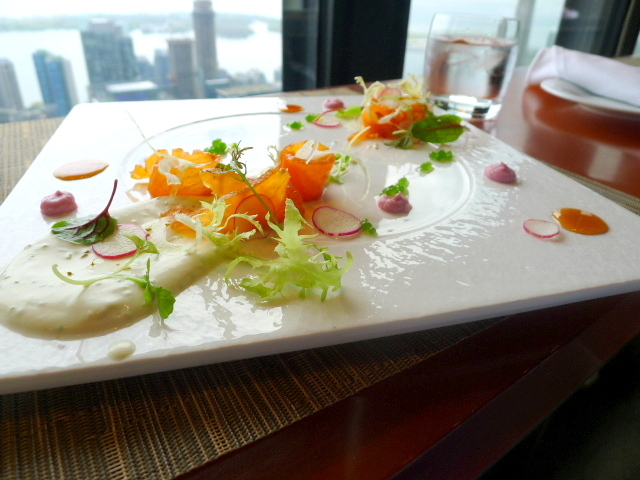 A starter of Maple British Columbia salmon gravlax ($17 – about £11) was lovely and had been successfully combined with a gently and beautifully fragranced Labrador tea cream that added aroma to the dish. 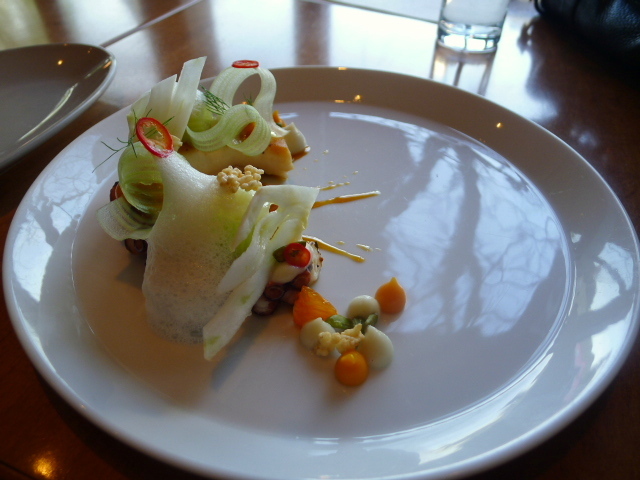 The use of radish, fennel and candied lemon proved fresh. Foie gras cured with Sortilège Maple Whisky and served with a wild berry jelly, and an Ontario white peanut purèe ($19 – about £12.20) was also very enjoyable. The jelly was great and the purèe was very tasty, although the sprinkling of some crushed peanuts turned out to be a little salty. The accompanying brioche could also have been a touch softer and more buttery. Olive oil poached Heritage Salmon ($23 – about £14.80) had been nicely cooked and was moist. It came with a fantastic citrus braised endive that was soft and moreish, and a lovely tangy barley accompaniment with a fine herb sour cream. 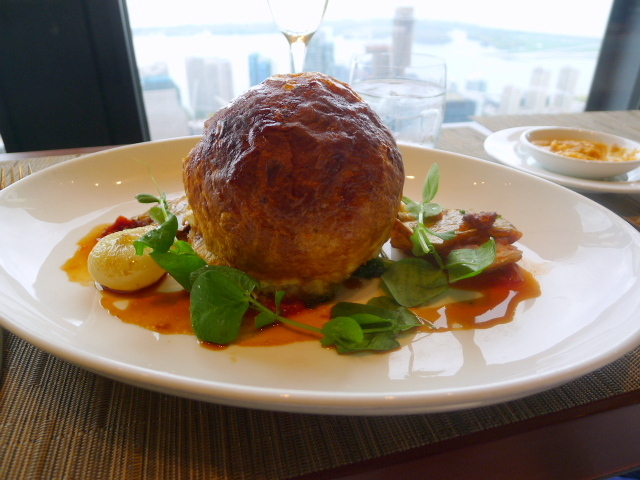 A tourtière is a traditional French-Canadian meat pie which has its origins in Quebec, and the ‘Classic’ Canoe tourtière with pea shoots, crispy fingerling potatoes and a black pepper ketchup ($24 – about £15.40) proved to be tasty. Made with beef and pork, the flavours were good, but the filing was a bit dry and the dish could have done with more sauce. The puff pastry encasing the pie was fabulous with its light, flaky texture. The potatoes were crispy and yummy. A desert of birch P & P tart ($12 – about £7.20) with caramelised pears and parsnip was an interesting and enjoyable finish to the meal. The pears were under done and too firm, but the parsnip, in the form of a parsnip pastry cream and a parsnip ice-cream, were delicious with lovely textures and only a hint of parsnip flavour. To complete the dessert was a pleasant, albeit slightly bitter, birch caramel sauce, parsnip crisps that could have been crunchier, and an almond pie crumble that added crunchiness to the tart. 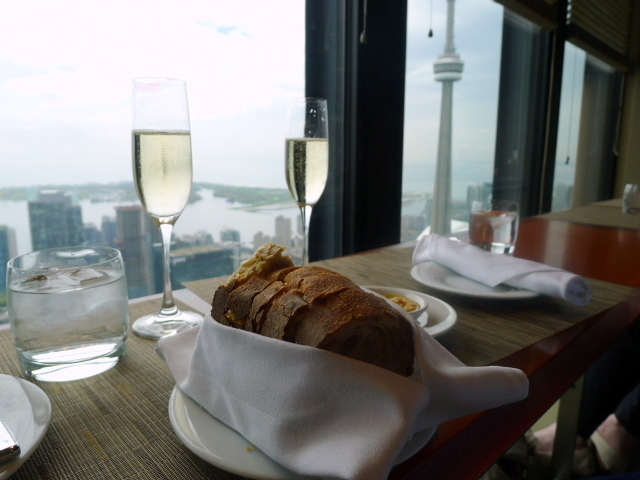 This was a highly enjoyable meal helped in no small part by the views. The service was also satisfying. I really recommend Canoe, but make sure you ask for a seat at the bar window for the best views. We went for lunch, but note that the dinner menu is pricier than the lunchtime menu. Lunch – CAD$42 to CAD$58 (about £27 to £37) for three courses. Dinner: CAD$67 to CAD$84 (about £43 to £54) for three courses. Excludes added taxes of 13%, drinks and service. I decided to go to Acadia because all the research that I had done had pointed to this restaurant being a pretty fine place to eat. The Globe & Mail, a Canadian newspaper, had given the restaurant a cracking review; and Joanne Kates, a notable Toronto food critic, had ranked Acadia as her second best restaurant of 2012. But first impressions of Acadia sank my heart. The space was pleasant enough, but the restaurant was empty when we arrived and things did not really get much busier during the rest of our meal. Now you may argue that we visited on a Monday night and that was the reason the restaurant was quiet, but when I looked at the pizza place across the road that was doing a heaving trade, I couldn’t help but wonder what the locals knew that I didn’t. I persevered with Acadia, but ultimately found that while the food was admirable in its attempt at innovation, it was somewhat lacklustre in its execution. 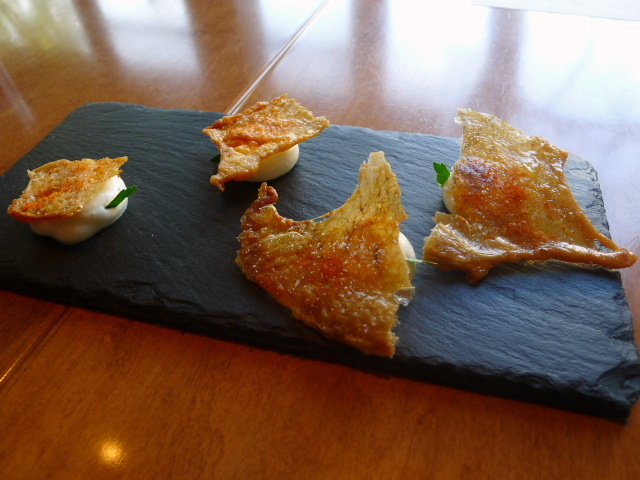 The food is ‘American’ and an appetiser of chicken cracklin’ ($4 – about £2.60) with hot sauce and blue cheese sounded as American as they came. Sadly, the crackling could have been crispier and the hot sauce, hotter. The blue cheese cream was fluffy and reasonably tasty, but on the whole this failed to set my heart alight. Charred octopus ($14 – about £9) was tender, and I liked the use of cara cara orange, fennel, Turkish pistachios and an olive oil emulsion in the dish. However, this starter called for something punchier to really lift it. 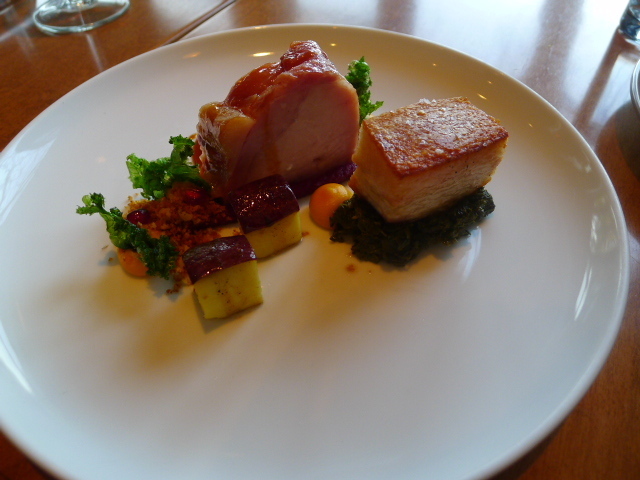 A slow roasted pork loin with pork belly, pecan nuts, kale, Japanese yam and pomegranate was a bit of a low point. The loin had been brined before roasting so its texture and flavour were decidedly odd. The kale was also quite mushy and it wasn’t particularly pleasant to eat. The belly wasn’t bad, but I couldn’t really find any love for this dish. We skipped this dessert. The food whilst ok, wasn’t amazing, and the lack of other bodies and atmosphere in the restaurant killed the experience for us. Eating at Acadia turned out to be hard work so it’s probably best avoided no matter what you read on the Toronto ‘Best Eat’ lists. Food rating: 3/5 (for its attempts at being innovative). CAD$43 to $50 (about £27.60 to £32) for three courses. The Distillery District sits east of downtown Toronto and houses a string of boutiques, cafes and restaurants, etc. It’s a gorgeous area with an urban gentrified feel to it. But what makes the Distillery District special is that it has a number of restaurants and cafes with alfresco spaces for those days when the sun comes out to play. Such was the Saturday afternoon when we visited the Distillery District. Temperatures had hit 24c and the sun blazed all afternoon long. With its very large outdoor dining area, the Pure Spirits Oyster House therefore proved the perfect place to laze our afternoon away. Oysters are their specialty and The Pure Spirits Oyster House offer a broad range of oysters from across Canada. 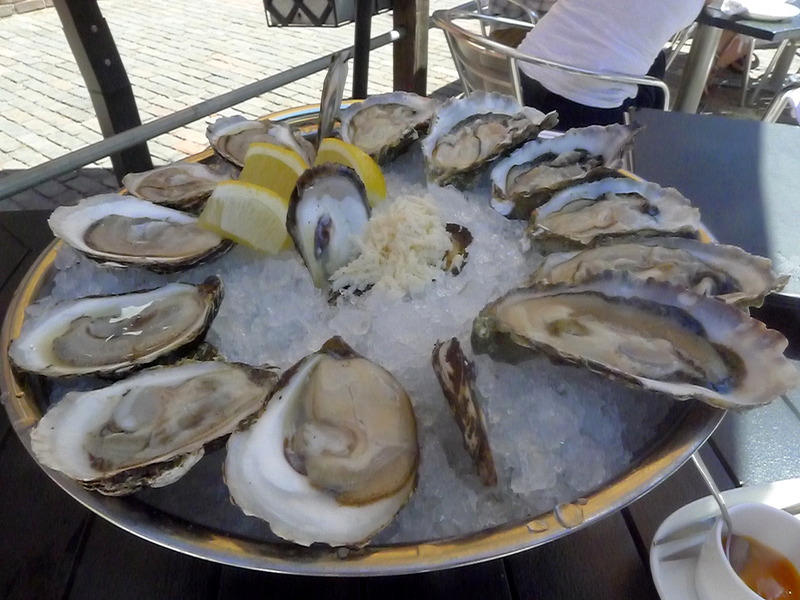 Our preference was for the meaty oysters and so we opted for the fabulous Fanny Bays from British Columbia ($2.50 each – about £1.60) that were smooth and creamy with a cucumber finish. Also on the agenda were the French Kisses from New Brunswick ($3.50 each – about £2.25) that were also delicious and robust in flavour. 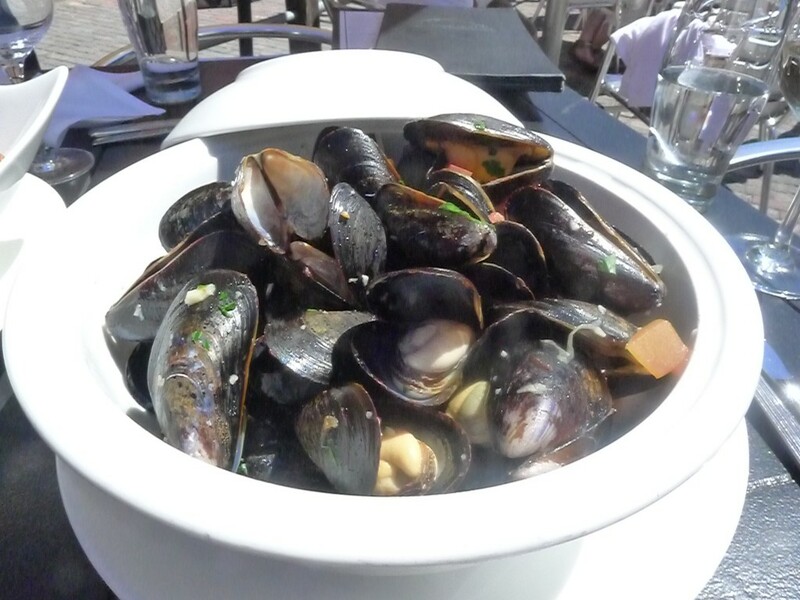 Traditional provençale mussels ($15 – about £9.70) with white wine, tomato and fresh herbs were nicely done. The mussels were juicy and there was a nice aromatic flavour coming through from the herbs. 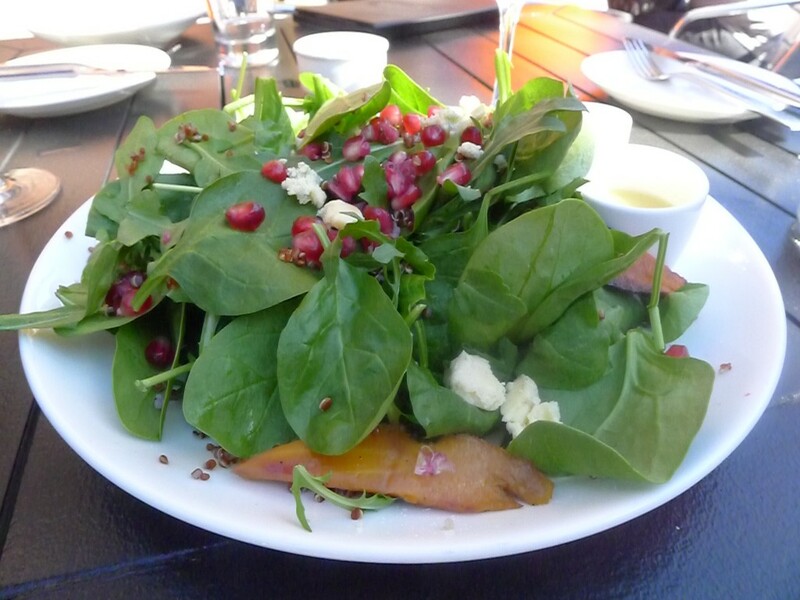 A salad of baby spinach and arugula ($13 – about £8.40) with organic red quinoa, roasted root vegetables, and a blue cheese and fresh pomegranate dressing was pleasant with the dressing being well judged for blueness. 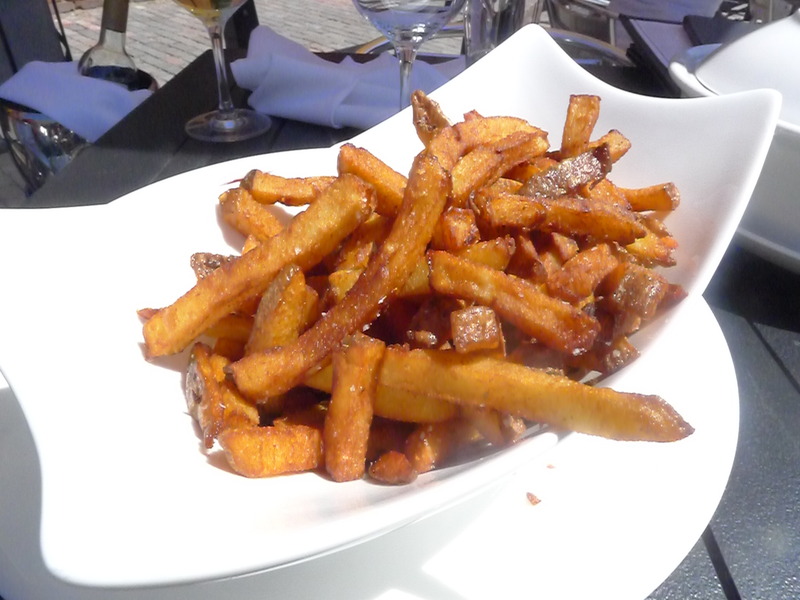 We also really enjoyed the enormous bowl of Yukon fries ($10 – about £6.50) with their distinctive sweet taste. 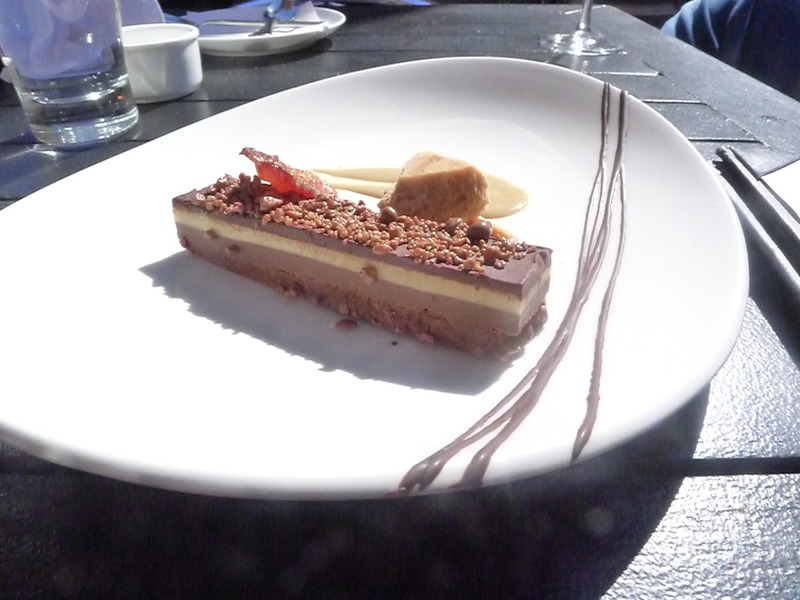 A crispy peanut butter chocolate bar ($9 – £5.80) of candied bacon, peanut butter crisps, and espresso anglais was yummy, and gave off popping notes with the use of a ‘pop rocks’ accompaniment. It was very rich, and a lighter texture for the chocolate would have worked better and given it more refinement. We enjoyed our time at The Pure Spirits Oyster House & Grill. The oysters were to-die-for and the dishes were decently executed. However, the service was extraordinarily slow, painful in fact. Perhaps it was due to the fact that Canadians are so laid back so they don’t have this desire to hurry things up. Whatever the reason, we ultimately didn’t mind too much as we weren’t in a rush, although the standard 15% service typically expected was hard to justify. The food at Pure Spirits Oyster House was hardly groundbreaking. It’s not the kind of restaurant you make a special trip for. But it’s decent, and on a fabulous sunny day I couldn’t think of a better place to just hang out. Lunch – CAD$28 to CAD$53 (about £18 to £34) for three courses. Dinner: CAD$34 to CAD$74 (about £22 to £47) for three courses. Glad you liked Canoe, I really like it as well. Pure Spirits is good but can be hit or miss. Thanks for your comment. 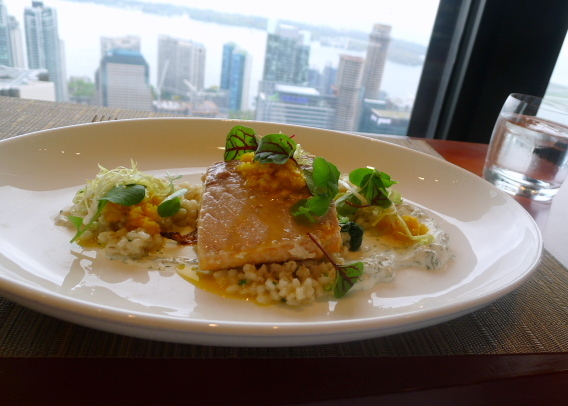 I really liked Canoe and would like an opportunity to try more of the Oliver & Bonacini restaurants. Maybe next time!